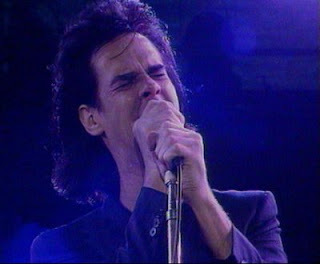 This is Nick Cave and The Bad Seeds performing live for the Black Session, a radio show broadcast on France Inter (French radio station) on this occasion recorded at Le Reservoir, Paris, France, back on the 19th May 1998, with a studio/location audience. Source: Live 'Black Session' recorded for France Inter in Paris, re-broadcast on the 30th May 2006. Sound Quality: Very good FM stereo @192kbps mp3. Genre: Alternative rock, post-punk, roots rock, and above all, Nick Cave with one of the best bands to surface in Australia. Set: This is the full Le Reservoir live session. Links: Official My Space site HERE. Comments: This is very good audio quality, that demonstrates just how good Nick Cave & The Bad Seeds are live. This is Dutch band Earth and Fire performing live on two occasions in the early 1970's. 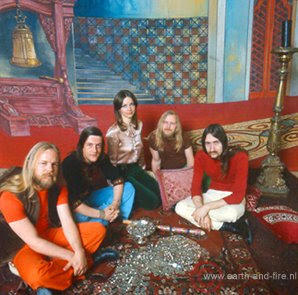 Earth & Fire were commercially popular in Holland, with a number of hit singles, which were played to a larger audience through offshore radio station Radio Northsea International (RNI) and subsequently Radio Caroline upon their return to air in the early 1970's. These platforms developed a growing British following, it is also clear the band were enjoyed in other neighboring country's. Earth & Fire were primarily a 'prog' rock band, that crossed over into the popular mainstream, because basically they made some superb individual songs. I occasionally describe some music as 'timeless' in other words the music sounds as fresh today as when it was first conceived, some of Earth & Fires songs fall comfortably into this bracket. The following material is from two separate gigs, the first live in Ijmuiden, Nederland (Holland), on the 17th June 1972. Having failed in April to present any new music recommendations, I will try and make up for that this month, so hopefully this is just part one. I first came across The Mummers late last year, and thought to myself, I must keep an eye on this act, and promptly forgot all about them. To my delight I was reminded with their appearance last month on Later With Jools Holland (BBC2 TV). Since then I have listened to everything available from them, and cannot recommend them highly enough. Fronted by the delightful Raissa (Khan-Panni), and with a superb collection of musicians , I would be surprised and very disappointed if The Mummers do not get much wider recognition this year. From Brighton, England check out The Mummers ! MP3: March Of The Dawn. Web Link: Official Site, MySpace. Having just released his thirty third solo album 'Together Through Life', which has received some very positive reviews, I thought it would be interesting to wind the clock back some 47 years! 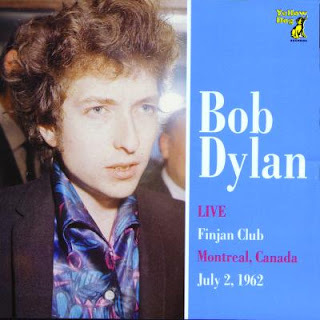 This is Bob Dylan back on the 2nd July 1962, live at the Finjan Club in Montreal, Quebec, Canada, a venue that I have no further details of, however judging from the audience, I would imagine it was quite an intimate affair. This is taken from the Yellow Dog, CD version (Cat No YD010), probably the best bootleg version of this show. Sound Quality: Very good, this version 192kbps (MP3). Genre: Bob Dylan (early, acoustic, folk period). Set: Full set (cannot confirm).